I’ve struggled with a name for this curry paste, so I’m just going generic “Thai Curry “. 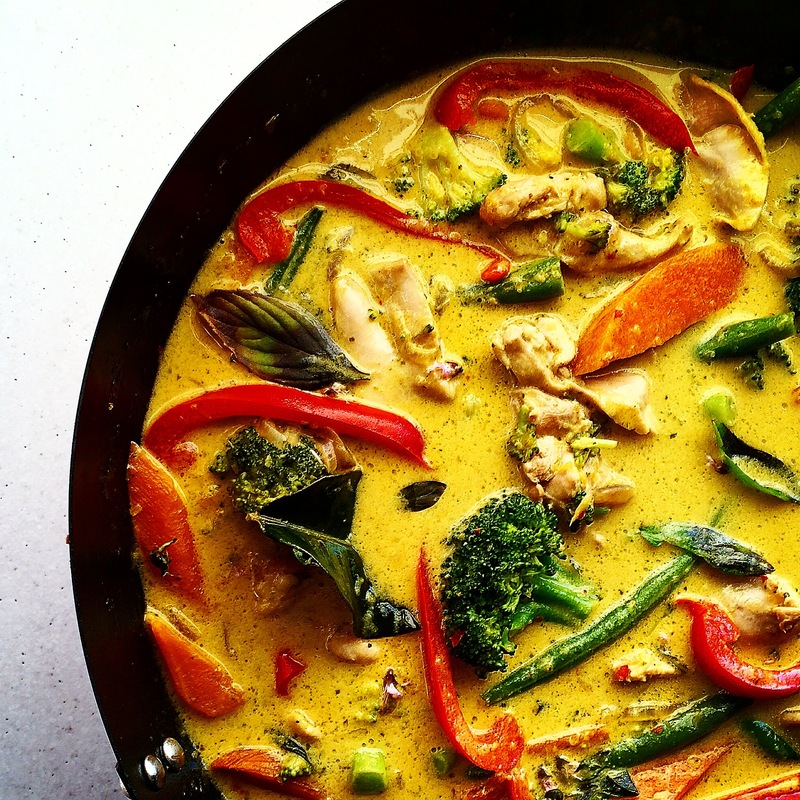 Its the colour of a yellow curry, with flavours of a green curry and a laksa mixed in. Ive kept the paste very mild in the heat department, so if you like it hot, double the chilli’s or use a couple of birds eyes. I use this paste for fish cakes, roast chicken, chicken meatballs, pork and quinoa patties and soups. The paste will last 3 weeks in the fridge and 2-3 months in the freezer. Dry roast the coriander and cumin seeds over medium heat, shaking the pan constantly, 2-3 minutes.Place the toasted spices and peppercorns into a mortar and pestle, pound until finely broken down. Wrap the shrimp paste in a small piece of foil and place under the grill, about 3 mins, turning twice. You will be able to smell it. Place ground spices, shrimp paste and chopped chilli’s into a food processor , pulse a couple if times. Add the rest of the ingredients and process until a paste forms. You will need to scrape down the sides every 30 secs. Store in jars with a layer of oil on top. * I buy all these ingredients in bulk or when on special and store them in my freezer. Place a large wok over medium heat and fry off the onion in the peanut oil until translucent, add the curry paste and continue cooking until fragrant. Pour in coconut cream/milk, stock and kaffir lime leaves, increase heat and bring to the boil, reduce heat to med, add chicken and vegetables and summer until cooked. Lastly add basil, fish sauce, lime juice and sugar, adjust to suit taste. Serve with brown rice and garnishes.